The event, which aimed to raise $1.9 million for the charitable cause, was attended by 420 guests and pals, including Ellie Goulding, Elizabeth Hurley, Joan Collins, and cousin Princess Beatrice. 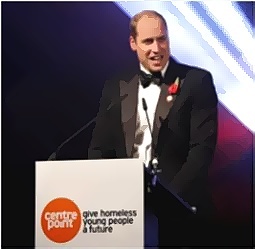 The 34-year-old prince gave a speech about the Centrepoint at the Kensington Palace’s Orangery. He hosts a fundraising event for the charity annually and it was one of Princess Diana’s favorite charities. The royal described the charity as working tirelessly to give young homeless people with a positive future. He continued that this evening was a celebration of everything, which young people are capable of when they are given the support that they need. He added that the young people of the charity have come through experiences that could have broken the resolve of anyone of us. Meanwhile, Prince William and wife Duchess Kate join the Queen at Royal Festival of Remembrance on November 12.